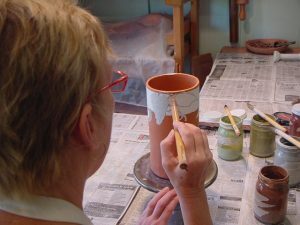 I hand build functional art pottery using an earthenware clay I make, creating usable food-safe pots more durable than traditional earthenware from Italy or Mexico. I hand build each piece, pinching coils and rolling out slabs I can drape over shapes, slice then reassemble, pinching, paddling and scraping into the form I want. But always aware of the function of the piece so lids fit and pitchers don’t dribble. 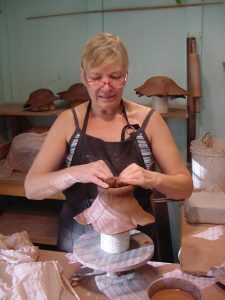 Like most artisans, I am employing the technical knowledge gained from years of practicing my craft to create whatever I can imagine, whatever I see in a dream,or in the clay itself. So sometimes these organic forms need feet or a nose or a grin. 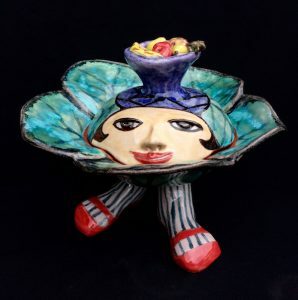 It makes me laugh when they come out of the kiln, with their own personality. And sometimes a piece needs colors and a design from my art history study or a museum exhibit seems to sketch itself, wrapping around the pot. The soft glaze colors I make along with a fe w bright commercial colors are all food safe. They are painted over a white glaze using calligraphy brushes then dipped in a clear glaze. In the high heat of the kiln, colors intensify, glazes bond to the clay. 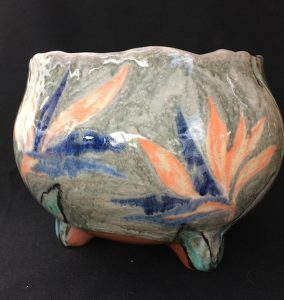 The finished pot is a marriage of art and craft unique to my hand and vision.